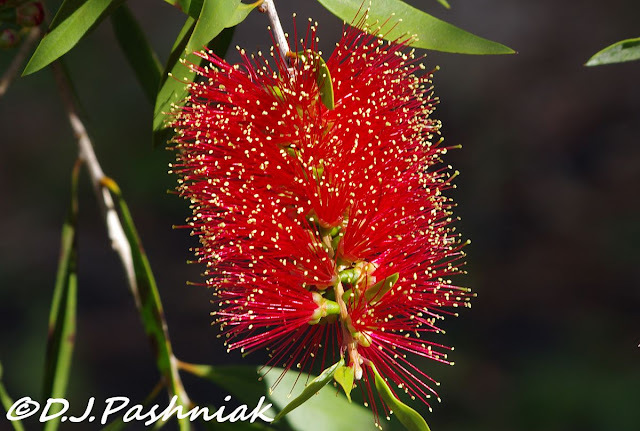 First these were called "Bottlebrush" then they become known as "Callistemon" and now they are "Melaleuca". Whatever the name the honey/nectar eating birds love them. I have a number of these bushes growing down the sides of my place. There are a number of red flowering ones and also ones with pale cream flowers. At present there is only this red one flowering. 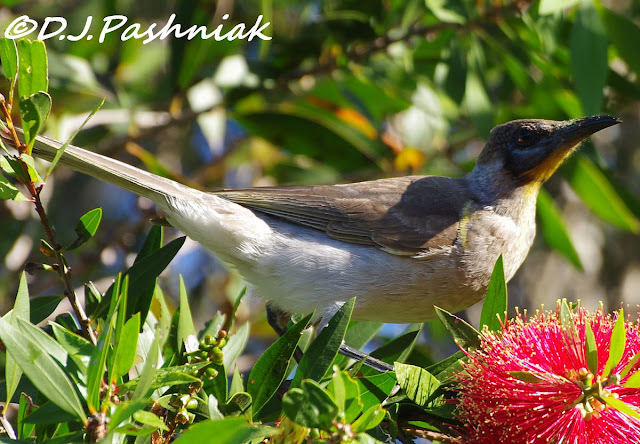 Yesterday there were a number of Little Friarbirds (Philemon citreogularis) on the flowers. Little Friarbirds have a naked bluish/grey skin on the head and face. 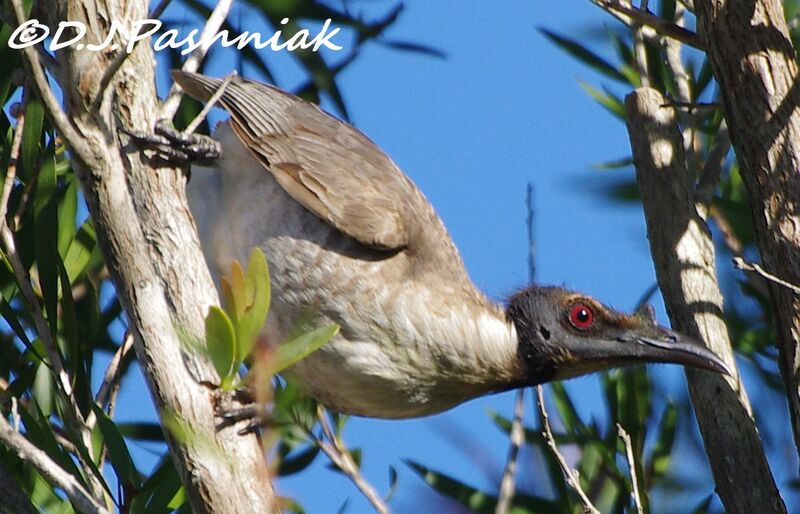 This is a Noisy Friarbird (Philemon corniculatus). The head is naked with black skin covering it. The most distinctive feature is that upright knob on the bill. These Blue-faced Honeyeaters (Entomyson cyanotis) are usually somewhere close but yesterday they were high up on the pine tree next door. 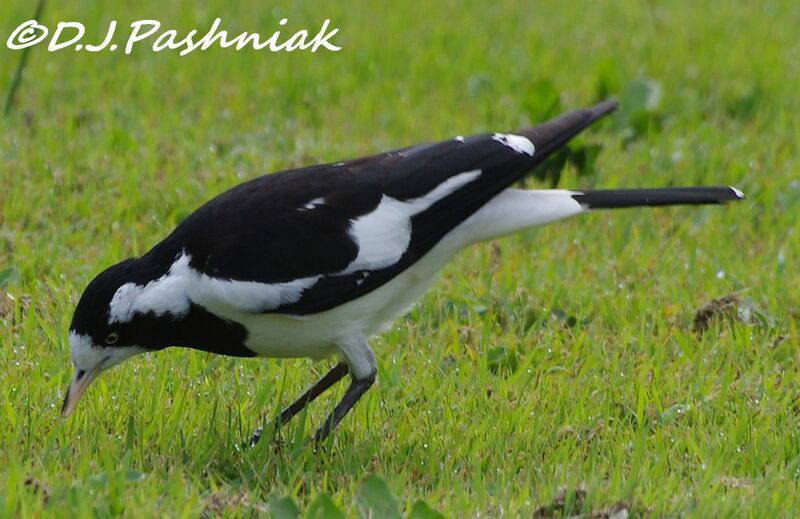 This is a female Magpie-lark (Grallina cyanoleuca) - I used to know them as Pee-wees.There are a pair of these that spend most of their time in the big pine tree next door but find most of their food somewhere on my lawn. We see Bottlebrush trees Florida ...I didn't know the other names. The birds are not one bit familiar ... But they are certainly fascinating. I wish I could see even a small fraction of your exotic (to me) birds! Thanks for showing them. Ah, I do love your birds!! The Bottlebrush is so colorful and beautiful -- and so are your captures for the day, Mick, as always!! Thank you so much for sharing the beauty!! Hope you have a great new week!! Hello, I love the bottlebush plant. It has neat blooms. Awesome variety of bird, great shots. Enjoy your new week! Beautiful photos of all the flowers and birds. It will always be a bottlebrush to me as it describes the flowers perfectly. Those friar birds look quite strange. I've never seen them before. I had a bottlebrush plant growing in my conservatory for years. Each Winter it would die back but each Spring the tubers would send up new shoots until one year it completely disappeared. As the name says the flower looks like a bottle brush. Good shot of bird! It is very interesting that the friar birds have naked heads like that. I wonder why that adaptation? 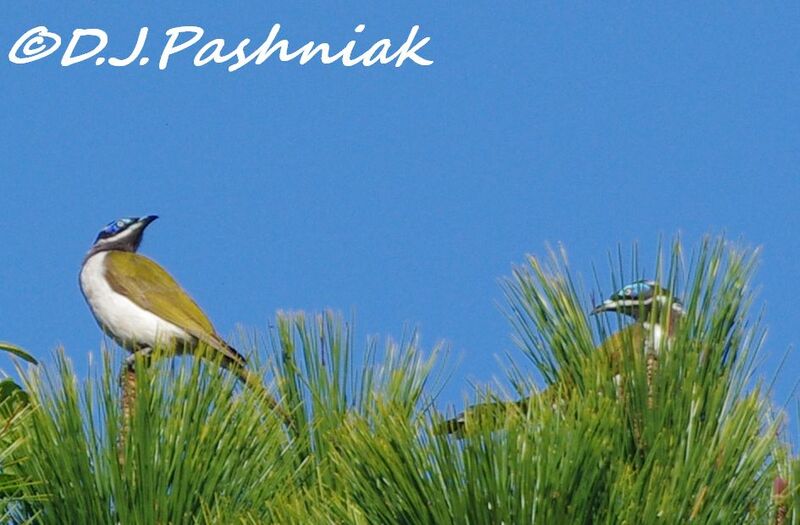 The Blue-faced Honeyeaters are just gorgeous and very striking. I didn't realise that "lesserlegs" are vagrants to Australia as well. Boy they get around don't they? What dazzling flowers and intriguing birds ~ All wonderful photos! 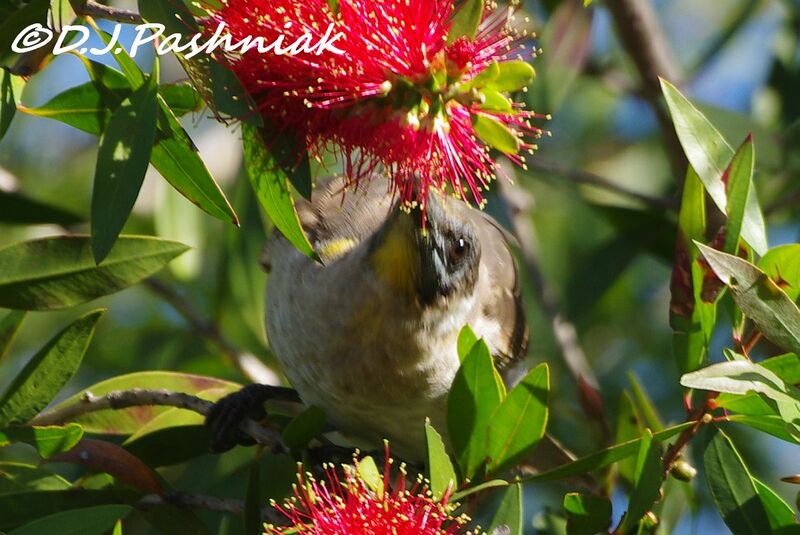 You have plenty of local colour from the 'Bottlebrush' to the bird species around you. Extremely quiet in the garden here! beautiful bush and lovely lark! The name bottlebrush describes them perfectly. I love the birds as well. We had these bushes in Arizona in our backyard. 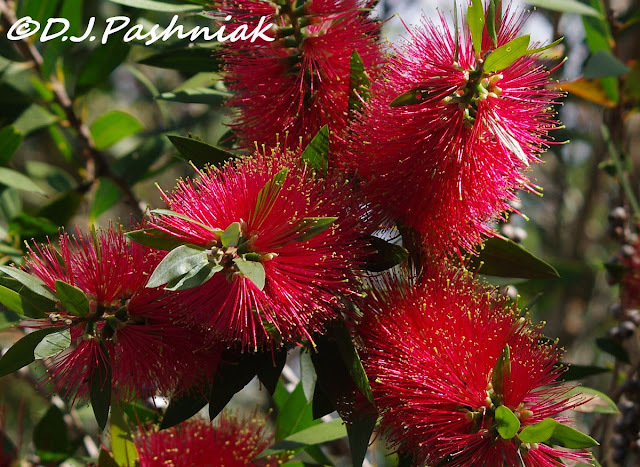 They were called bottlebrush. I've always thought they were a very pretty tree/bush. The Friarbird is hideous. Ha! Another bird I've never seen before. Beautiful photos of the birds and the flowers. Amazing photos! Loved seeing this variety of visiting birds you have. Wonderful! I used to say that the phrase 'there is a honeyeater in the bottle-brush' was about as good a marker that I was somewhere new as any I could think of! What a great series Mick! I love bottle brushes and the birds they attract. I just love the vibrancy of the red bottlebrushes, we have them here too, they flower throughout the year but really come out in summer around Christmas.